Less than a month after the Charlie Hebdo murders and the slaughter of four Jews at a kosher supermarket in Paris, Islamic State (IS, or ISIS) has sent a warning now to Belgium: "This," they wrote in a letter to Het Laatste News (HLN), "is only the beginning." The letter, received by HLN's editors on Feb. 4, referred also to a series of attacks in France that pre-dated the Paris massacres: "What happened in France will happen, too, in Belgium," the typewritten letter stated in perfect French, "and from Belgium, IS will conquer all of Europe." The same day, news arrived in the Netherlands that Dutch jihadist Abu Hanief had just blown himself up in Fallujah – the fourth Dutch Muslim to commit a suicide bombing in Syria or Iraq. Hanief, 32, had been among the leaders of pro-IS demonstrations last summer in the Hague in which demonstrators called for the death of Jews. Though he was arrested on charges of hate speech after the protest, he was soon released; and evidently, despite government efforts to confiscate or cancel the passports of Dutch Muslims suspected of planning to join the Syrian jihad, he shortly thereafter slipped out undetected. This is Europe now, poised at a moment when, while anti-Semitism is at record highs in France and the UK, Muslim groups call for "anti-Islamophobia" policies and boycotts against Israel; when officials in Wolfsburg, Germany, are investigating an alleged jihadist cell with ties to IS and as many as 50 members, most of them living in Germany; when Belgian police have arrested 15 people in the town of Verviers (population 56,000) and several others throughout the country, all since the Paris terrorist attacks that ran from Jan. 7-Jan. 9. And no wonder, as some so-called "mainstream" Muslims now refuse to distance themselves from the acts of Muslim terrorists – including the atrocities committed by the Islamic State: Noted Shabir Burhani, a religious Muslim in his 20s and a student at the University of Leiden in the Netherlands, "We have to accept Islam in its entirety, not try to adjust it to the times. Sharia is part of it, as are jihad and the Islamic state." But Burhani, who previously served as spokesman for the now-defunct Sharia4Holland, does not view ISIS as the ideal, he told Dutch daily Trouw. It's not the murders themselves he rejects, he said, but "the way IS does it, and shows it off to the world can be counterproductive. Does that really benefit Islam?" He is not the only one: at a Jan. 16 forum held in Amsterdam Muslim groups presented a manifesto against Islamophobia. Coming just days after the slaughter of four Jews in Paris and six months after the execution of four others in Brussels, the document begins by describing anti-Semitism in the Netherlands – where in August, Hanief led hundreds in a chant of "Kill Jews" – as "mild," while "Islamophobia is anything but." And what are some of the symptoms of this "Islamophobia?" Some are legitimate concerns: Muslim youth face job discrimination. Families receive hate letters from neighbors. People demand that Muslims in the Netherlands distance themselves from Islamic terrorism. Apparently this, as Burhani states, is anti-Islam. Now, France debates the future of its cherished secularism and the future feasibility of a secular state in a democracy in which millions of religious Muslims, whose religion contradicts secular ideals, make their home. Many seem to feel that democracy demands allowing the religious to practice their beliefs – all beliefs, in all religions, as their faith requires. Secularism, they seem to suggest, is itself "Islamophobic." But if some believers demand the conquest of their faith over others, even by the sword, what then? If Burhani is right, and the jihadists of IS are merely practicing their religion, can a democratic society rightly shut them out? It can. And it must. Secularism, after all, does not demand the faithful forfeit their belief within the private sphere. And neither does democracy. We must not allow radical and jihadist Muslims to conquer our bright democratic vision by blindly destroying it ourselves. One of the major objectives of those who want to establish a worldwide Islamic state is to silence criticism of Islam. Sadly President Obama is cooperating with those who wish to silence criticism of Islam. It's really not surprising that militant Islam is gaining ground worldwide and becoming increasingly menacing and dangerous. President Obama and to a lesser extent his predecessor George W. Bush have done the American public a grave disservice by proclaiming Islam to be a religion of peace. As commonly practiced it too often is very far from that. Anyone who takes the time to read the Quran will see that this book is extremely militant and warlike, far more so than the Bible or most any religious publication. This is why it is often interpreted the way Islamic militants interpret it. Without apology our leaders need to tell the public some very painful truths. We are very much at war with a religious ideology. Stop denying it! We are at war with the Quran or at least a common interpretation of the Quran. Admit it! The Quran's god is very dissimilar from the Jewish or Christian god as far as character attributes are concerned. Our leaders need to tell the public that the proportion of Muslims who support violent jihad is a highly significant number. Instead they peddle the lie that the number is extremely small. We cannot defeat militant Islam with military force alone. Strong measures need to be taken to halt the recruitment of jihadists here at home. We need to undertake countermeasures against the propaganda that ISIS and other organizations are using to expand their numbers. Without apology we should tell the gruesome story of the enormous amount of totally unnecessary mass death and suffering has resulted from the practice of militant Islam in its various forms. I think the French would cut off their baguettes rather than become a religious nation. And it agree Muslims need to do more to counter those who commit atrocities in their name. I look to the Muslims in Denmark who symbolically stood before a synagogue to protect it. 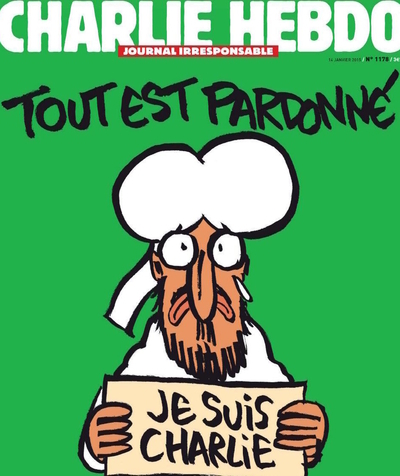 Charlie Hebdo - no, Charles Martel - yes. France, and all of Europe, has faced multiple Islamic invasions over the centuries. Previous invasions came as military conquest attempts. Now, under the guise of immigration and diversity, they are progressing with their 'non-violent' take over of Europe, and any country that bows to the UN pressure of mandatory immigration from middle eastern countries. This kind of invasion is more difficult to oppose as they use the countries laws against the citizens of that country. It is time for a 'Charles Martel' to rise up and drive back the invading forces. The rally cry in France should not be 'Je Suis Charlie Hebdo' but rather 'Je Suis Charles Martel' if they want to save their nation and their sovereignty.